In case you’ve never heard of Magewell, they are a Chinese company from Nanjing specialising in video capture cards. Of course there’s lots of little-known companies in Asia that make video capture cards, often aimed at the CCTV market, many of which don’t work with applications like VidBlaster or vMix, so you might wonder what makes Magewell different? Their primary market is AudioVisual and Streaming, so their products are designed to have DirectShow drivers for Windows and are tested for use with software like Adobe FMLE, making them a natural fit with Livecast, OBS, vMix, VidBlaster, Wirecast, XSplit and many other applications too. 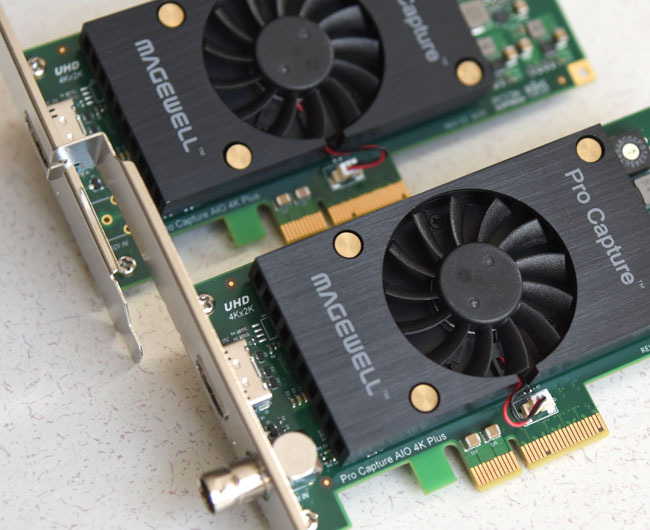 We have a number of these Magewell dual channel HD capture cards at a fraction of their original price due to one customer's product design change making these cards surplus to requirements. The XI200XE-Mini is the predecessor of the Pro Capture Dual DVI card, with similar input capabilities. So two channels of SD/HD up to 1080p60, via either DVI, HDMI (with embedded stereo audio), VGA, YUV component or composite. Read more here. 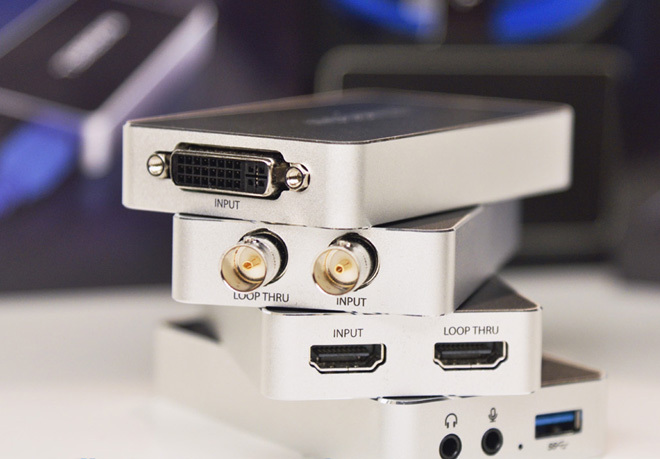 HDMI & SDI versions feature Loop Thru connections, plus there's a multi-format DVI model too (which can take VGA, HDMI and analogue/YUV via a breakout cable). The new devices are in addition to the standard 32060/70 capture dongles, now in Gen-2 form, rather than directly replacing them. USB3 Capture Plus 4K versions have started shipping too, in 6G SDI & HDMI 2.0 versions. 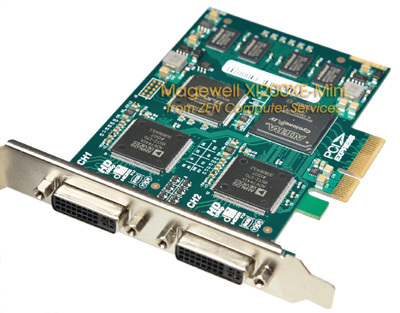 There's a wide range of PCIe cards and USB3 video capture devices available from Magewell, from single input to multi-input, SD to 4K resolutions, and with connections that include analogue composite or YUV component, VGA, DVI, HDMI and SDI/HDSDI. Many of the devices have analogue audio inputs, and in the case of HDMI & SDI connections, support embedded digital audio (up to 8 channels on the Pro Capture cards). The Pro Capture 4K cards (above) include SDI+HDMI (AIO) and HDMI-only versions, capable of capturing up to 4096x2160 at 60p via HDMI 2.0, or at 30fps via 6G SDI. The LT version of the HDMI 4K Plus (below) has a HDMI2.0 Loop Thru output of the input signal. For HD productions, the range includes PCIe cards with up to 4x HDMI or HD-SDI inputs (Pro Capture single, Dual & Quad versions), as well as a dual input analogue/VGA/DVI/HDMI (Pro Capture Dual DVI). For SD-only production, there are both PCIe and USB3 devices with 6x video+audio inputs (XI006AE & XI006AUSB). All of these PCIe cards and standard-sized USB3 boxes employ Magewell drivers which include an enhanced DirectShow Properties panel (Pro Capture version pictured above). It’s here that you can select the input source on devices which have multiple connection options per channel, but you don’t always have to do that because the driver software will try to auto-detect the input that’s being used (unlike Blackmagic cards). The other useful settings include some proc-amp controls for colour adjustment, de-interlacing and dealing with aspect ratio conversion. The video above looks mainly at the XI204 hybrid PCIe card, and includes details of the settings available via the Properties panel. Towards the end it also shows the XI006AUSB external USB3 box with six SD inputs connected. If you want a device that's highly portable, yet easy to use, the pocket-sized 32060/32070 USB3 Capture Dongles are available in two versions, one with HD-SDI and the other with an HDMI input. More than one dongle can be connected to the same PC, and there's no drivers to install, which is useful if you need to use them on multiple machines - especially when they belong to other people who don't allow additional driver software to be installed on their systems. They're compatible with a wide variety of USB3 host controllers, including those found on motherboards with the Intel Ivy Bridge & Haswell chipsets. You'll notice that the way the video input appears under Windows is as an Imaging Device, just like a webcam. This is unlike many video capture devices which appear as Sound, Video & Game Controllers. This is significant because some video software is primarily designed to accept input from webcams and may not accept video from other types of device. In the Device Manager Properties panel, you will see that the Magewell USB3 Dongle uses the default Microsoft driver. This means it will always work with any Windows application that expects the input to be from a webcam. 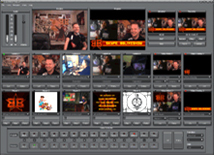 That includes things like Skype, Google Plus Hangouts, Flash Media Live Encoder, and VidBlaster of course. As for the audio, the USB3 dongle shows up in the list of Windows Recording Devices, and will decode standard stereo audio that's embedded in the HDMI feed. In other words, simple uncompressed PCM stereo audio - it can't deal with things like Dolby stereo or surround sound encoding. In VidBlaster, for example, in the list of video sources in a Camera module, it appears as a XI100DUSB-HDMI device and, if you look at the list of Video Resolution options, you'll see a selection of pixel sizes that go from 640 by 360 all the way up to full HD 1920 by 1080 and beyond. It will capture at a range of frame rates, up to 60 frames per second. At the electronic input, the video resolution is always detected automatically, so what you're seeing here, in the software, is what the dongle is actually passing over the USB bus, to the host application. Any scaling and frame-rate re-sampling is done in the dongle itself. If you don't want the video to be processed externally, set the resolution in the software to match that of the actual video source. The Magewell dongle is capable of capturing computer video output. When it's connected to a graphics card output, it appears to Windows like a multi-standard monitor, offering a wide range of PC & broadcast video resolutions & frame rates. This makes it quite easy to duplicate most resolutions used by the main display, whenever this is required. If you don’t have a USB3 port available, it's worth mentioning that the Magewell dongle will work in a limited way when connected to a USB2 port. Of course you'll only get full resolution and frame rate if you use a USB3 port, because the reduced bandwidth that's available from a USB2 port is insufficient for full frame rate at higher resolutions. Sometimes that's less of a limitation than it may first appear. For example, you may want to capture the slides from a Powerpoint presentation, you want them in HD, but they don't actually change very quickly. In this case, capturing at a lower frame rate whilst still maintaining HD resolution is probably quite an acceptable compromise. Alternatively, you might have a camera source that you need to stream, which only outputs full HD at 1080, and you need 30 frames per second to avoid jerky movement. Without compression, 1080 at 30frames per second generates more data than a USB2 bus can handle, but if you're only streaming at a much lower resolution, like 640 by 360, you can take advantage of the fact that the dongle will scale the video before it sends it over the USB bus, so setting the device output to 640x360, even though it has been scaled from a 1080 source, will actually work over a USB2 connection. 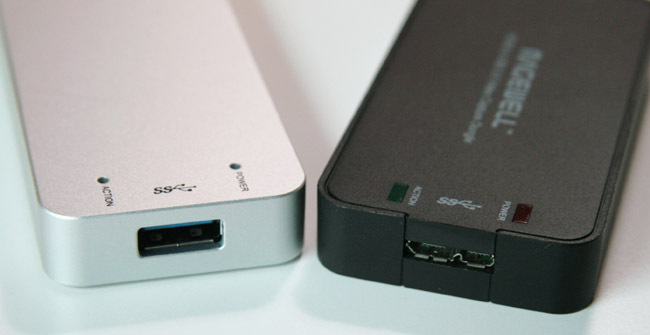 Gen-2 versions of the USB Capture devices are physically similar, with the same metal case but, inside, the circuitry resembles the Capture Plus models, with additional features over the Gen-1 which include control over cropping, image flip/mirror, aspect ratio conversion and extra de-interlacing options. Copyright © 2019 Zen Computer Services.